See below for a write-up. Too much to take in? Check out our full service offer. To set up your first league, it's usually easiest to start setting it up in LITE by simply clicking on Schedule a League on the home page and then upgrading to PRO (click PRO features once you get to your LITE schedule). You can skip to step 3 or 4 if you've done this. 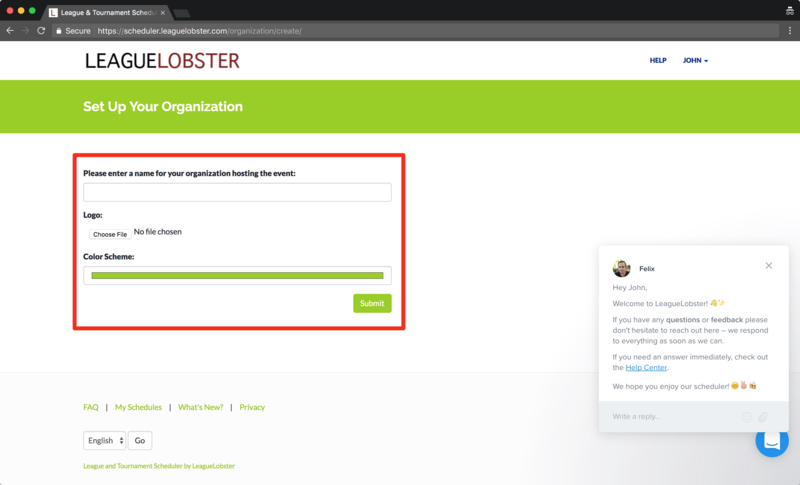 First, you'll enter the name of your club or organization – you can also upload a logo and pick a color for your public schedule pages. You can change all of this later. Note the welcome message on the bottom right – you can always reach us by clicking that blue button. 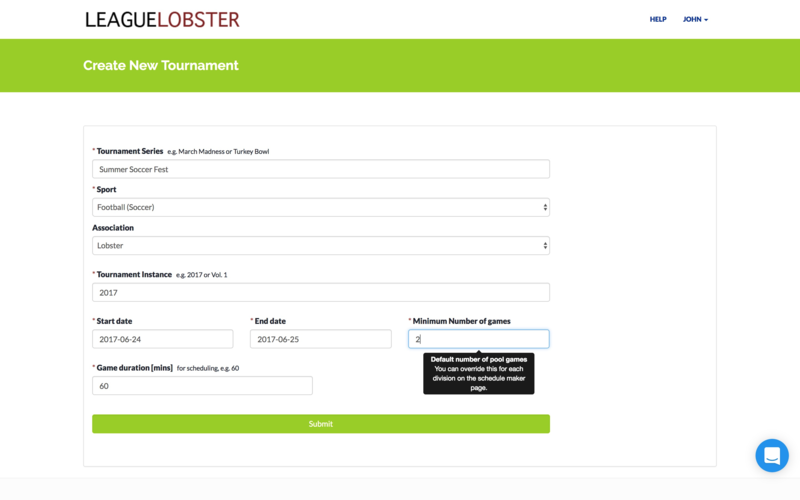 Next, you'll enter basic info about your tournament, such as the name of your event (tournament series + tournament instance = full event name; e.g. 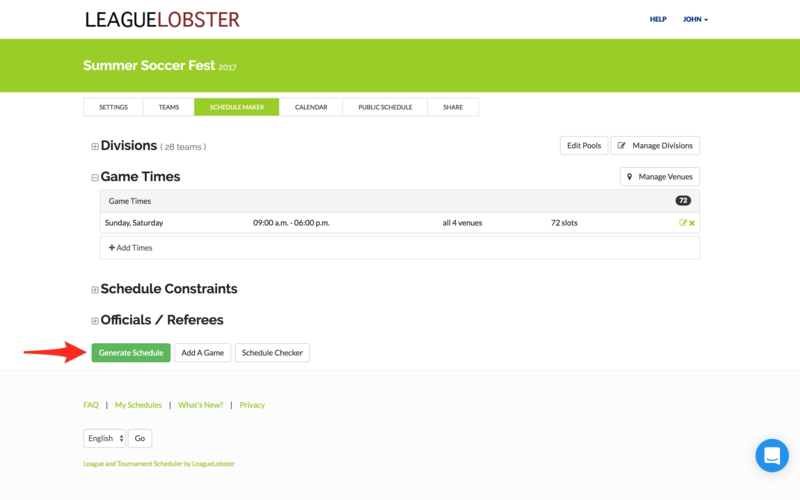 Summer Soccer Fest 2017 in the example below) and the start and end date. Again, you can change all of this later. Minimum number of games will be used as the default number of pool games (pre-bracket) so enter the most common scenario here. 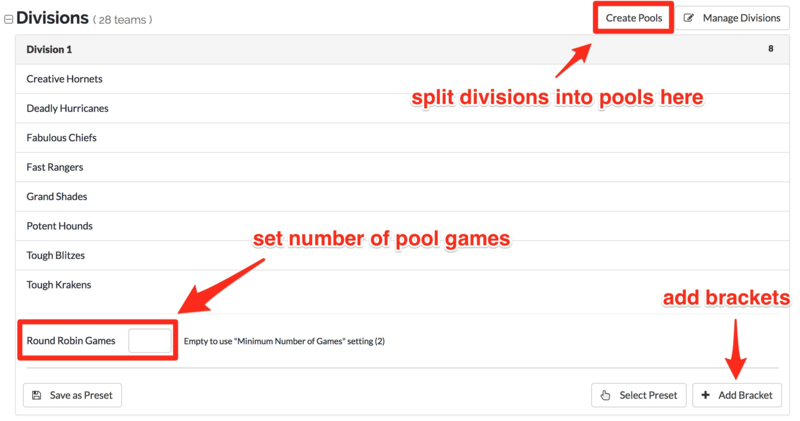 You can set a different number for each pool later. Next, you'll want to add divisions and teams. Click Manage Divisions to add divisions. If you have a lot of teams and divisions, use the Bulk Team Entry. Once you've added your teams, head over to the SCHEDULE MAKER tab and expand the Divisions section. You can further divide divisions into pools using the Create Pools button at the top. You'll then want to enter a number of pool games for each division and add brackets. If you only play bracket games, you'll want to enter 0 for Round Robin Games/Pool Games. For more on brackets, see this article. You can also select from predefined presets if there are any for your division size. If there isn't a preset you like, you can also save your own presets, so that you can easily copy a division setup to other divisions with the same number of teams. 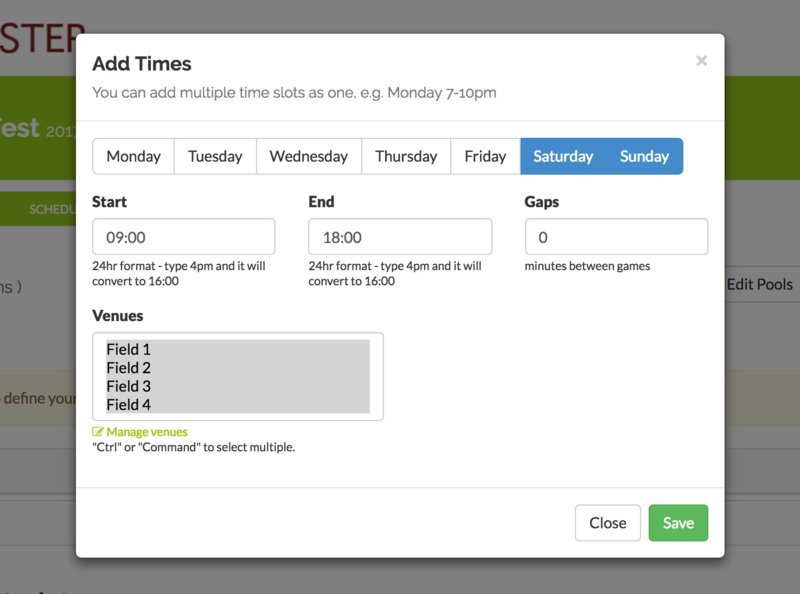 Click Manage Venues to add fields/courts. 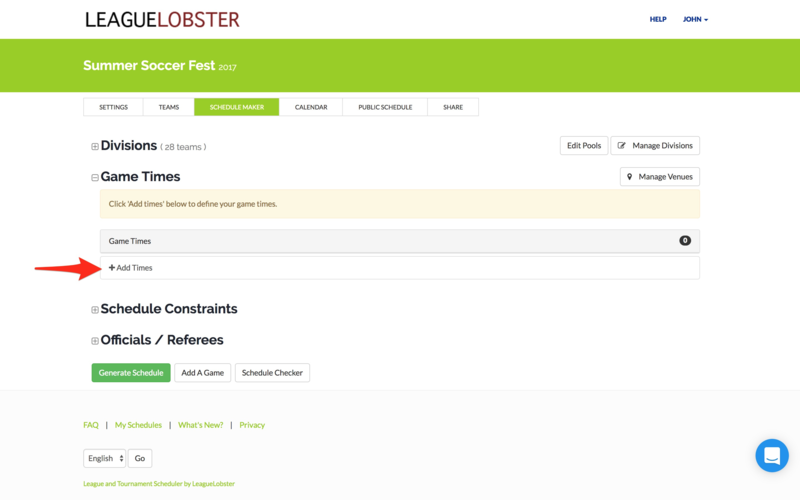 You can enter team requests and division constraints etc. under the Schedule Constraints section. See this article. Click Generate Schedule and wait for the generator to finish. Depending on how complex your tournament is, this can be very quick or take 10-20 minutes. See this article on making manual changes and this one on using the calendar view to do so. 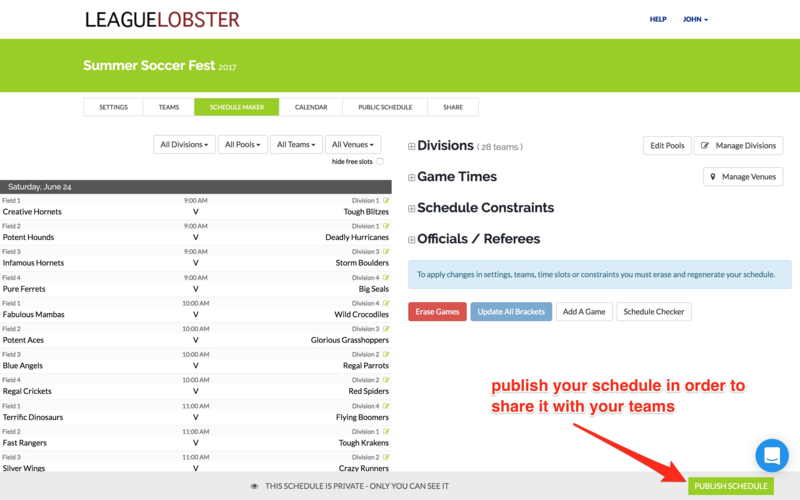 Once you're happy with your schedule, you'll want to publish it and share it with your teams. Click the Publish Schedule button at the bottom of your screen to enter your payment method. 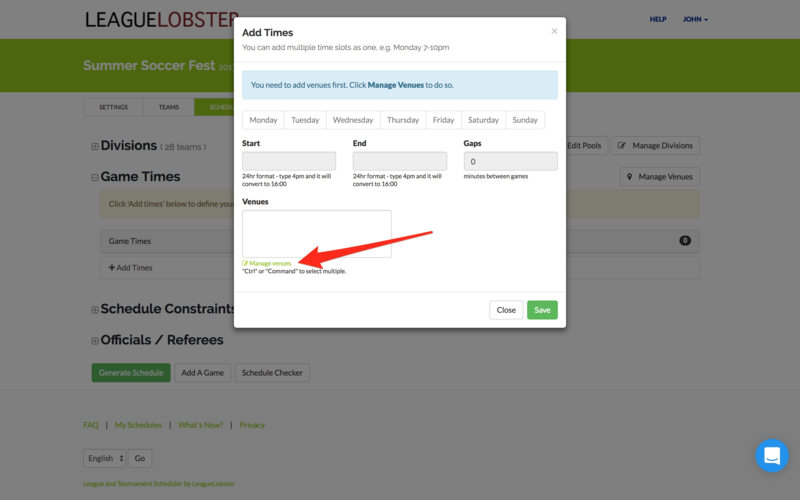 Click the SHARE button at the top for all the ways to get your schedule in front of your players. Check out our full service offer.